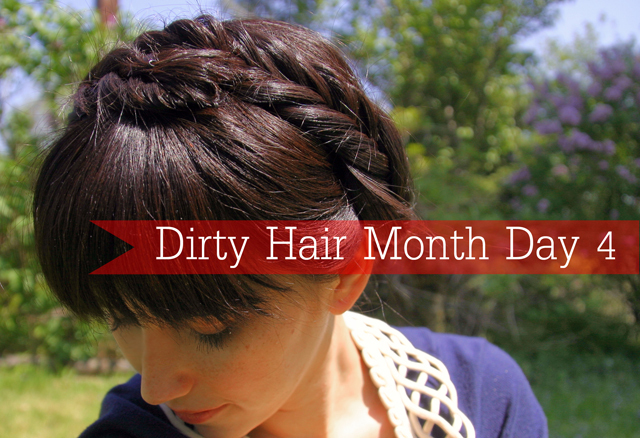 Dirty Hair Month Day 4! Milkmaid Braids. Do either fishtail or plain braids. Classic look. Great for those really greasy days! And hey! If you also have bangs just give them a quick wet down and blow dry. Get when you don't have any time but need a wash! Sorry about the quality of this video. I couldn't find my tripod and then for some reason I'm still not quite sure why it came out small in a box? I'll have to check my camera settings to see what I'm doing wrong. Hopefully tomorrow will be better! Aww, you look great! You don't need makeup. In fact, right before you said you didn't have makeup on, both of my kids said you were pretty. Thanks for the great hair ideas. My hair is getting long and I am in need of ideas for my hair. This will be cute on daughter #3 who often conveniently forgets her shower and I forget too.